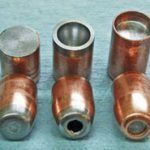 Bullet swaging die sets that are in-stock and can be shipped now are listed below. There may be one set in stock or there may be more than one. These are first come, first served so who-ever places an order first gets the set. The caliber and type of set (the type of bullet made) will change often so if you don’t see what you want now perhaps tomorrow it will be there. Complete die sets are usually listed. However individual dies may be ordered instead of a complete set or in addition to a set. In-stock sets will be for the Walnut Hill press or other presses made by RCE, LLC™. No other type of dies will be stocked. To order please go to the “How To Order” page. Three die set to make a .224″ bullet for 22 centerfire rifles. Flat base bullet with a 8S (spitzer) open tip ogive. Includes a .191″ core swage die, core seat die with punches for J4 & Sierra jackets, and the point form die. Includes a seating punch for jackets made from 22LR cases. Use commercial drawn jackets. Die set to make both flat base and rebated boattail open tip bullets. Included are the core swage, core seat, BT-1 die, and point form dies. Seating punches are included for J4 jackets. Makes a medium VLD bullet that has an ogive about the same length as a 10s spitzer. This VLD is better suited to rifles that have less room in the magazine. The bullet is intended for long range competition and is not recommended for hunting. Die set to make a longer VLD bullet that is better suited to bolt action rifles or for single loading. The set includes the core swage, core seat, BT-1, and the point form dies. Makes both flat base and open tip bullets. Seating punches for J4 jackets are included. Good long range target bullet but due to the small tip opening not recommended for hunting. Rebated boattail (RBT) die set that would be added to a three die flat base set. With the RBT set both flat base and rebated boattail bullets can be made. Generally used with 8S or longer ogives to make bullets better suited for long range shooting. 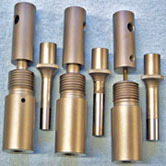 Three die set to make a .251″ flat base bullet with a long truncated conical (TC) ogive that has about a 5/32″ wide flat tip. Makes hollow point, open tip, and solid lead tip bullets. Use fired 22 short cases or cut off 22LR cases for the jackets. Makes a .257″ flat base bullet that has an open tip 8S (spitzer) ogive. .205″ core swage, core seat, and point form dies. Two seating punches for J4 jackets. Fired 22 WMR and 22 WRF cases can be used for jackets. Make rebated boattail (RBT) bullets in 264 (6.5 mm) caliber by adding this set to a three die 264 flat base set. Includes the boattail one die (BT-1), an internal RBT punch for use with the flat base core seat die, and a rebated boattail point form external punch. Boattail bullets are useful for long range shooting and generally are best with a longer ogive such as an 8S or longer. Makes a .312″ lead bullet. Bleeds off excess lead as the bullet is swaged. Comes with a flat base and hollow base internal punch. 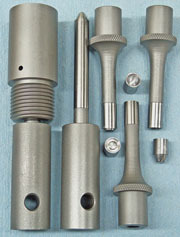 Three external punches to make a target wadcutter (TWC) bullet, a short flat tip conical bullet, and a flat face punch. Punches can be interchanged to make flat base TWC bullets, hollow base TWC bullets, conical flat tip bullets with either a hollow base or flat base. The hollow base internal punch can be used with the flat face external punch to make a “Manstopper” style bullet. The die with the flat face punches can be used as a core swage for 355 to 358 caliber bullets. 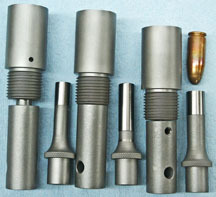 Four die set makes a .329″ bullet for the 8 mm Hungarian-Steyr Carbine. Includes a 30 caliber jacket expanded die and a .329″ to .323″ bullet resizer to make standard 8 mm bullets. Single die to make a .357″ lead bullet. Makes a hollow base and a flat base. Three nose punches make a Target Wadcutter nose, a short round nose for light weight bullets, and a short spitzer ogive. Makes a .357″ diameter bullet for use in 357 Magnum, 38 Special, and other 38 caliber handguns. Good bullet for use with a Winchester 92 chambered for the 357 Mag. or other lever guns. The set includes a .318″ core swage, core seat, and round nose, flat tip point form die. The flat tip is about 7/32″ diameter (.219″) making the bullet good for tubular magazines. Makes open tip, flush tip, and hollow point bullets. 9 mm and 380 ACP cases can be used for jackets. Makes a .366″ bullet (9.3 mm) with a 4S open tip ogive. Includes a core seat punch for jackets made from fired 223/5.56 cartridge cases. Also include is a 5.56 case to 366 jacket maker. Lead Bullet die to make a .452″ bullet. Makes a flat base bullet that has a H&G 68 nose. This is shorter than a Keith style and has the corners rounded to improve feeding in autoloading pistols. The bullet has a small step where the ogive and bearing meet. 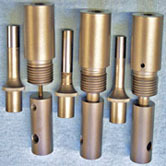 Three die set makes a .475″ flat base bullet that has a 1 1/4E round nose ogive. Makes open tip and flush tip bullets. Good bullet for the 475 #2 Nitro Express, 475 Ackley Magnum, 475 A&M Magnum, or similar rifles. Best with mid to heavy weight bullets. The set was tested using 308 Winchester cases for the jacket but copper tubing jackets can be used. Three die set. Flat base, round nose, flat tip .500″ diameter bullet. Makes hollow point, open tip, and solid lead tips. Use belted magnum cases for the jacket or type L tubing. 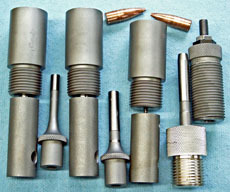 Photo shows the bullets that can be made. On the left the core was seated outside of the jacket to make a solid lead tip bullet, the middle bullet is a hollow point, and on the right the core was seated inside of the jacket to make a flush tip bullet. The flush tip has the jacket rolled over the meplat of the bullet to improve feeding in autoloaders.